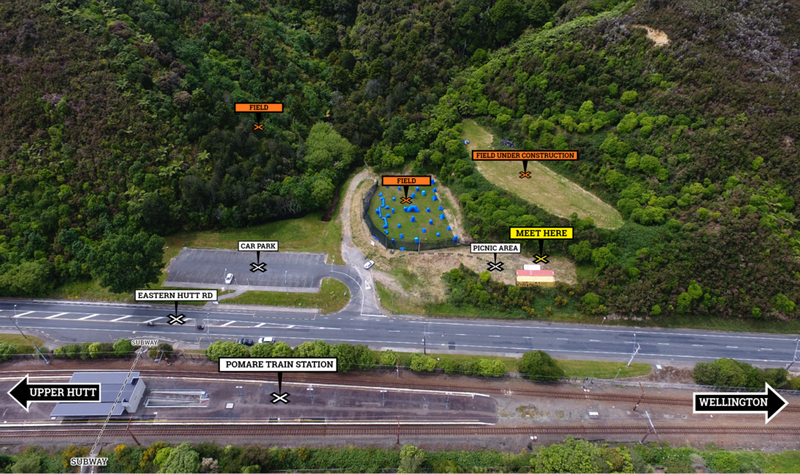 Situated in thick bush, our Lower Hutt location gives you a real "thrill of the chase" experience. In Hostility Creek threats can come from any direction, and you are always in the middle of the action. Natural creeks, hills, banks, and man-made bunkers and forts provide relief in a treacherous landscape. This field is ideal for adrenaline seekers and smaller groups, where we can throw you into all-on-all battles or objective based scenarios. The field caters for up to 100 people, in conjunction with our equally thrilling inflatable field. Our ready-room, in which we will greet you and brief your group before play, contains seats and tables for your convenience. We have a portaloo onsite for your use. If you're thinking of having food and drink after playing, please bring water bottles or plastic cups . Ensure your group has been to the bathroom before arriving. To plan your journey via Metlink public transport, use this link here and set your destination to Paintball Corp Hostility Creek.